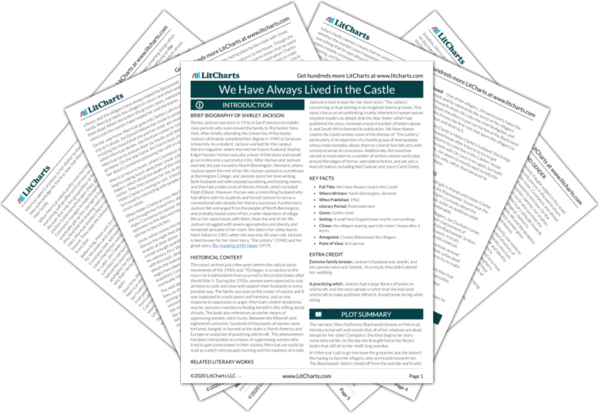 Instant downloads of all 942 LitChart PDFs (including We Have Always Lived in the Castle). 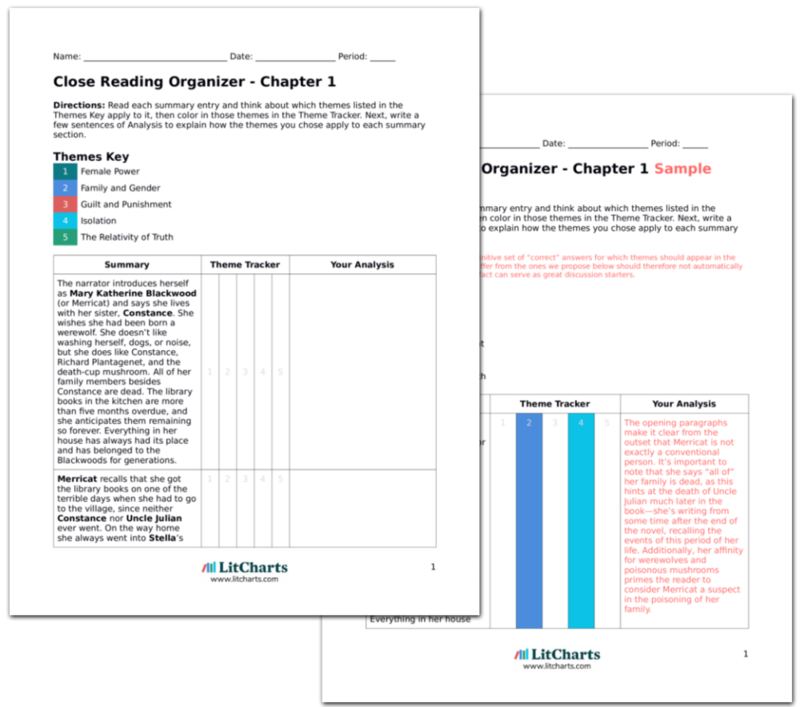 LitCharts assigns a color and icon to each theme in We Have Always Lived in the Castle, which you can use to track the themes throughout the work. Over time the sisters develop a pattern for their days and create a happy life. Every morning Merricat makes sure the front door is locked. Now that the gates to the path are open, children come and play on the lawn. However, they seem uneasy, and Merricat wonders if they’ve actually been sent to look for the sisters. When Constance comes to look out at them, Merricat says to pretend they’re just birds, because they’ll never see the sisters. The kitchen is dark until Merricat opens the door in the morning, and Constance makes breakfast. The locked front door becomes a symbol of safety and isolation in this new life. However, the isolation is not to be so complete as it seemed, since people can now come to the lawn. Characteristically, Merricat wishes these visitors away by imagining that they are birds. They continue to eat food almost ritualistically. One night Merricat barricades the sides of the house with pieces of junk. If anyone tries to get past it, the noise they’ll make will be a warning. Merricat nails boards across the window in the kitchen door and thinks she might try mending the broken step. Merricat does all she can to keep everyone out, thinking of these as safety measures. In trying to fix the step that Joe Dunham and Charles have failed to fix, she takes on a new, almost masculine role. During breakfast one morning, Merricat laughs that they’re on the moon, but it’s not as she imagined. Constance thinks it’s a happy place and says they should preserve as much food from the garden as they can. They leave the kitchen door open when they go to the garden, because they can see whether anyone’s coming. The vegetables are still covered with ash. In saying that they’re living on the moon, Merricat means both that they’re as far from the rest of the world as the moon is from the Earth, and that she adores their way of life just as much as her imagined life on the moon. Their life centers more than ever around food. Constance cleans Uncle Julian’s room. She keeps his papers in their box and puts it down in the cellar for safekeeping, as she thinks he would want. Merricat goes to check the front door. Whenever she does this, the children are playing on the lawn and people are walking on their path. They seem to do it only to show it can be done. Though Constance keeps Uncle Julian’s papers, she closes another door against their past by relegating the papers to the cellar. The villagers seem to both fear the sisters and show their defiance by trespassing, and Merricat compulsively checks the lock to keep them out. 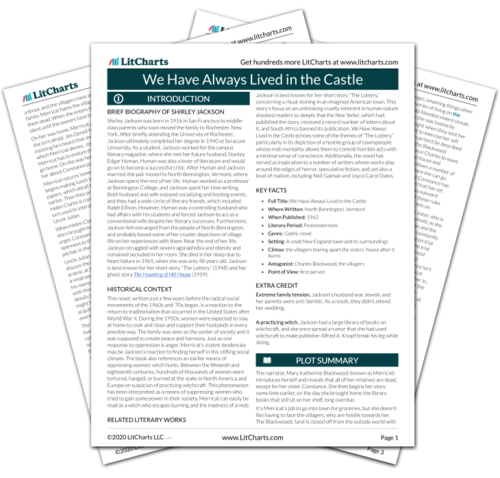 Get the entire Always Lived in the Castle LitChart as a printable PDF. Constance discovers two suits in Uncle Julian’s room. She barely remembers him going to buy a suit once. Merricat asks what he would have been wearing on the night of the poisoning, because he would have liked them to remember. Constance says that when she got him at the hospital he was wearing pajamas. She points out that the suits are the only clothes that didn’t burn. They’ll have to wear them. Merricat says she isn’t allowed to touch Uncle Julian’s things, so she’ll make herself clothes from leaves and moss. Constance says Merricat is allowed, but Merricat insists she isn’t. The sisters now remember the poisoning more as a way of remembering Uncle Julian than for its own sake. Constance shows that she’s perfectly willing to break social rules now, as she wants to wear male suits. This contributes to the sense that the society within the house has broken with gender traditions, and that Constance is no longer threatened by Blackwood men like Charles. Constance laughs and gets tablecloths out of the pantry. She says Merricat can wear those, and Merricat is pleased. However, Constance has no sewing materials, so Merricat has to drape them and tie them with a cord. Suddenly Constance is aghast at the state of their life, and blames herself. Merricat insists that they’re going to be very happy this way. Merricat dresses in a red and white check tablecloth. Constance looks sad, but Merricat likes it. Constance thinks it used to be used for breakfasts on the lawn. Merricat says sometimes she’ll be a summer breakfast, sometimes a formal dinner. Merricat now immerses herself in food and its power more than ever by wearing the accessories of a meal and actually saying (metaphorically) that she’s becoming food. The outside world recedes as the sisters break more and more rules of normality—just imagine a villager’s reaction to finding Constance dressed in a suit and Merricat in a tablecloth. Though Constance temporarily sees this as a tragedy, she adjusts her thinking with Merricat’s urging. Merricat convinces Constance to wheel Uncle Julian’s chair out to add to the barricade. Merricat can no longer imagine him in it, and she’s worried that he might entirely vanish. However, Constance plants a rosebush in the spot on the lawn where he used to sit, and Merricat buries his pencil by the creek. She never goes in his room. Even though Merricat never exactly mourns Uncle Julian’s death, she does feel that he deserves to be remembered. His wheelchair now helps protect them from the outside world. Though the sisters didn’t go to his burial, both sisters bury things that represent him. Helen Clarke returns to knock and call for the sisters, but when she sees the barricade she goes away. One evening, there’s a soft knock at the door, and they go to it. Someone quietly calls their names outside. He says his wife made a chicken, cookies, and a pie for them. He’s sorry he broke one of their chairs. He leaves a basket. Later, when they finish dinner, they bring the basket inside. The food is still warm, and Constance imagines the woman making it. She says she must wash the napkins before they put the basket back on the porch. This evening marks a new phase of the sisters’ life, in which their complete isolation begins to be tempered by the villagers’ attempts at apology, which they accept. Of course, it is significant that the villagers reach out to the sisters using food left on the doorstep—in this way, the villagers are acquiescing to the sisters’ terms, accepting their isolation and honoring their fixation on food. The villagers, in a way, are finally bending slightly to Merricat’s reality. The villagers begin to leave all kinds of food for the sisters in the evenings. They imagine that the women have the food ready when the men come home from work, and the men seem to want to hide from each other, as though they’re ashamed to bring the food. Sometimes there are notes in the baskets apologizing for breaking different household items. Merricat and Constance never retrieve the baskets until they can be sure no one is around. Though the villagers used to want to punish the sisters, they are now the ones feeling guilty and doing penance. Furthermore, Merricat seems to imagine that the men’s unwillingness to be seen bringing food shows their fear, and is thus an example of men relinquishing some of the power given to them by patriarchal society. Merricat discovers that she’s not allowed to go to the creek anymore because Uncle Julian is there and it’s too far from Constance. She’s also not allowed to bury anything or touch stone. She repairs the boards over the windows and constantly makes sure the front door is locked. They spend lots of time sitting on either side of the front door, watching the people outside. The pencil of Uncle Julian’s that Merricat buried at the creek acts almost like a ghost, as she feels that it makes Julian present there. Merricat’s rules multiply nonsensically, confining her life more and more and complicating the idea that Merricat’s power over herself and Constance is a source of their freedom. Even though the sisters have isolated themselves, they become increasingly fascinated with the outside world. One day a group of bicyclists come and rest on the lawn. The sisters learn from the bicyclists’ conversation that vines are growing over the burned roof. The strangers don’t look straight at the house, and they shush each other, unsure whether anyone inside can hear them. They warn their children away from the house, one woman saying that the ladies inside will poison the boys and eat the girls. She says they hunt children at night. Since the sisters don’t even go into their front yard, they have to depend on the perspective of outsiders to learn about their own house. People begin to see the house as haunted by the sisters, adding to the impression of them as witches. In one sense, this entire book can be read as a story of how a haunted house comes to be. One afternoon, Charles arrives in a car with another man. They walk up to the steps, and Merricat remembers the first time Charles came, thinking that this time he won’t get in. Constance knows it too. The strange man asks whether the sisters are inside, and Charles says they are, along with a fortune of unknown value. The man wants to get a picture of Charles talking to one of the sisters, and Charles agrees to try to get them to come out as long as he gets half of whatever money the man makes from the picture. Though Charles has left the sisters’ life, he did so more or less of his own accord, meaning that they did not exactly conquer him. This time when he arrives, Merricat and Constance are of one mind—Constance won’t betray Merricat a second time by letting him in. Charles hasn’t changed a bit, as his main goal is still to wring money from his family in whatever way he can. The man hides behind the car and Charles calls out to Constance. Merricat can tell that she now sees Charles for what he is. Charles says he wants to forget the past and be friends. He’s been waiting to hear from Constance and wants her to let him in. Constance smiles unpleasantly up at the door. Charles says he put flowers on Uncle Julian’s grave that morning, and compliments Julian. Charles is horribly duplicitous, shamelessly trying to regain Constance’s confidence for his own financial gain and even saying nice things about Uncle Julian after insulting him repeatedly to his face. Constance is no longer fooled—she now sees that Charles isn’t good and never was. The man says that Charles is wasting his breath, but Charles says he needs to see them because it’s his fault that the sisters shut themselves up in the house. He really does want to talk to Constance. He says the man could get pictures of him with the house, but the man says it’s a waste of time. Charles begs Constance to open the door, saying he doesn’t deserve this treatment. The man wants to leave, and Charles tells Constance that he’s never going to come back. Merricat is afraid he’s not going to leave quickly enough for Constance to contain herself. He gets in the car reluctantly, and then Constance and Merricat burst into raucous laughter. Constance says she’s incredibly happy. It does seem for a moment that Charles actually feels some guilt for the damage he caused to the family. As Charles becomes increasingly desperate, the power of Constance’s denial of him grows. Charles thinks that Constance truly needs him and can’t possibly let him go forever. However, Constance exercises the ultimate triumph over him by seeing him for the fool he is and laughing him off, rather than even giving him enough importance to hate him. This moment represents the sisters’ final rejection of the patriarchy and heterosexuality. One Sunday, the Carringtons park outside the house and look at it. Now that the drawing room and the dining room are shut up, different parts of the house become important to the sisters. Constance is always afraid that one of the two cups with handles will break. They wear Uncle Julian’s clothes and the tablecloths. There are always flowers on the table. Merricat is no longer allowed to go to the field, and she feels that the safeguards she buried were meant to protect a different house. Now her safeguards are the lock, the boards, and the barricades. The sisters have built a new life for themselves, and though it may seem bizarre to outsiders, they’re happy with it. In fact, if their biggest worry is that a cup will break, it’s hard not to envy them. Their clothes represent almost a mockery of heterosexuality, as Constance dresses in a man’s clothes and Merricat in tablecloths that gesture mockingly to the traditional female role in the home. Meanwhile, their house becomes almost militarized, and the space available to them shrinks. In the evenings, people walk past the house, speculating about the ladies inside. The sisters think that people will start calling the path Lover’s Lane, perhaps after Charles. Constance says Charles should have shot himself in the head in the driveway. They learn that the vines have made the house barely recognizable. Children are afraid of it. When one boy runs onto the porch and shouts a line of the old mocking rhyme on a dare, someone leaves a basket of food with a note of apology that night. Merricat wonders if she could eat a child, but Constance said she probably couldn’t cook one. Merricat pities the people outside, who have so much to fear, and Constance says she’s afraid of spiders. Merricat says that she and Jonas will keep all the spiders away from her. The sisters’ comment about Lover’s Lane supports the idea, always vague, that Charles and Constance were romantically involved. Constance expresses her only violent fantasy, showing the depth of her rejection of Charles. The villagers now fear the sisters in an almost reverential way. Embracing their role as reclusive witches, Merricat and Constance’s final lines also confirm their roles in the house; Constance will cook and Merricat will eat, no matter what it might be. Finally Merricat can pity the villagers rather than hating them, as she no longer fears them, which gives her more comfort and power over them than she ever had. Greider, Julia. "We Have Always Lived in the Castle Chapter 10." LitCharts. LitCharts LLC, 22 May 2017. Web. 22 Apr 2019. Greider, Julia. "We Have Always Lived in the Castle Chapter 10." LitCharts LLC, May 22, 2017. Retrieved April 22, 2019. https://www.litcharts.com/lit/we-have-always-lived-in-the-castle/chapter-10.